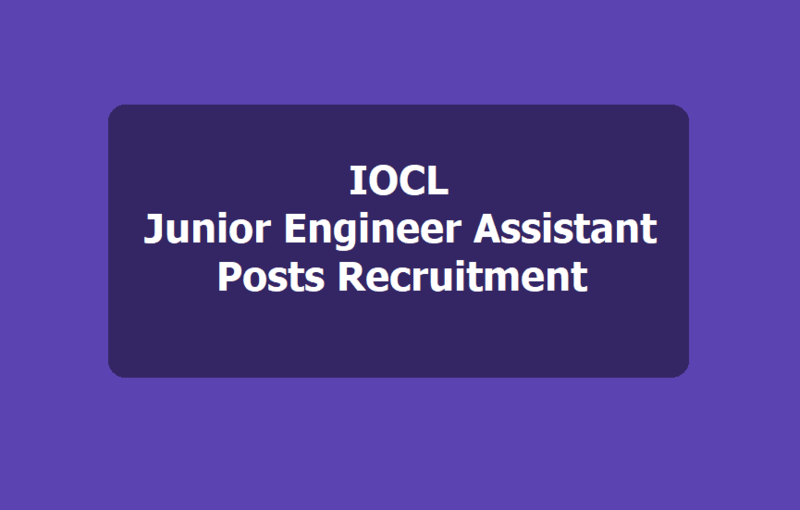 IOCL Junior Engineer Assistant Post Recruitment 2019, Apply online till January 28: Indian Oil Corporation Limited has published the Junior Engineering Assistant Posts Recruitment 2018 and IOCL invites applications for the recruitment of Non-Executives against regular posts at Mathura Refinery. Indian Oil Corporation Limited (IOCL) has begun online application process for recruitment of Junior Engineering Assistant-IV posts. IOCL will recruit on 42 Junior Engineering Assistant posts. Candidates with three year diploma in engineering are eligible to apply for this recruitment. However, this is not the only eligibility requirement and applicants should read the recruitment notice before applying. Out of the 42 vacancies, 14 are in Production, 2 in Power and Utility, 8 in Electrical, 10 in Mechanical, and 8 in Instrumentation. To be considered for recruitment, the prescribed qualification should be from a recognized University/Institute as a regular full time course (Industrial training as part of the course with no break) with minimum 50% marks (45% for SC/ST and PwBD category candidates against reserved positions) in aggregate. Apart from the minimum academic eligibility requirement, the applicant should also have one year post qualification experience. Women candidates are not allowed for Junior Engineering Assistant post in Production, and Power and Utility. They can apply for vacancies in all other categories mentioned above. The link to the online registration of the application is available on the IOCL official website: www.iocl.com. The last date to apply is January 28, 2019. The written test for selection will likely be held in February 2019. Indian Oil Corporation Limited, Mathura Refinery invites online applications for the following posts. Qualification: ITI, Diploma, B.Sc. (relevant discipline) with post qualification experience. Selection: Based on Written Test, Skill/ Proficiency/ Physical Test. Age limit: Minimum 18 years and maximum 26 years as on 31.08.2016. Online registration of application commences: 07.01.2019. Last date of submission of online application: 28.01.2019. Last date of receipt of printout of online application: 04.02.2019. Date of written test: February 2019. How to apply: Candidates apply on-line from 09.09.2016 to 30.09.2016.